Unsecure WiFi connections – Isn’t it great when you flip open your laptop or iPhone/iTouch and find a free WiFi signal – whether from your hotel, friends house, or even some unknown connection nearby. But BEWARE! If that connection is not secure (e.g. has the little “lock” symbol on it) someone can “sniff” your connection and see everything you do online. Internet Cafes – these can be really convenient when you don’t have a laptop (or its too awkward to lug around!). However, these places are NOT secure. You really don’t have any control over who can monitor your browsing, text chats, logins, and everything else you do online. AlwaysOnPC (http://www.alwaysonpc.com) offers a subscription service for just a couple bucks a month and gives you the security you need for public WiFi and borrowed or Internet Café computers. Since AlwaysOnPC operates like a “remote desktop” this ensures that none of the content you are browsing (like your email, or bank account website) ever passes over the local Internet connection where you are: the browsing is actually happening on your AlwaysOnPC and only the screen image and controls are passed back and forth to your laptop or Internet café PC. The connection is encrypted for security. 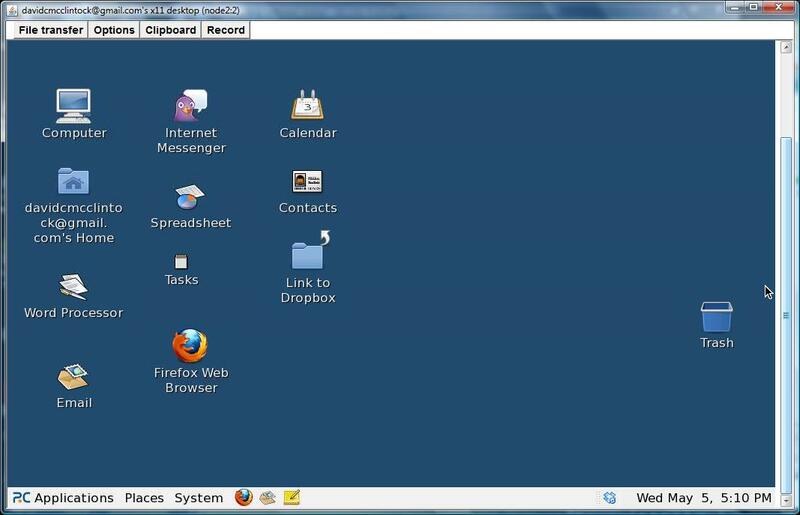 Once you register, you simply login and click “connect” and a little Java applet opens a window showing your virtual PC desktop – complete with over 40 apps like FireFox, as well as Office apps for Word, Excel and Powerpoint editing, photo editing, and many more. It also includes 2Gb of online storage. Just go to our website to sign up. So travel well, and stay in touch – but don’t compromise your security — use AlwaysOnPC!